Today’s COTD is a reprint of a key unit for a mono-Blade Wing deck! [CONT](VC):If the number of <> in your soul is fifteen or more, this unit gets [Critical]+2. 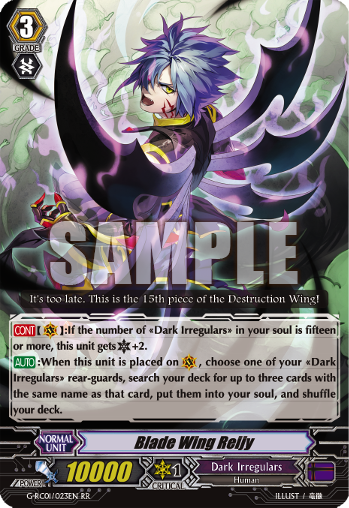 [AUTO]:When this unit is placed on (VC), choose one of your <> rear-guards, search your deck for up to three cards with the same name as that card, put them into your soul, and shuffle your deck.